On the joyous occasion of Holi, hundreds of former knee and hip replacement patients celebrate life after surgery at Dr. Shekhar Agarwal’s Holi Milan. Dr. Shekhar Agarwal is an established joint replacement surgeon performing over 1,000 replacement surgeries every year. People suffering from end-stage arthritis “many of whom have lost all hope and the ability to walk, climb stairs or conduct day-to-day activities are able to resume normal life after undergoing successful knee and hip surgery by Dr. Shekhar Agarwal. Holi Milan offers them a chance to share their experiences and revel in the joy of their complete recovery. Every year more than 400 patients attend the event along with their families, where they dance, play games like musical chairs, and listen to poetry while enjoying a delicious spread of Indian street food and sweets. As part of the fun, awards are given in different categories, including the best dancer, and the oldest and youngest patients to have undergone surgery. 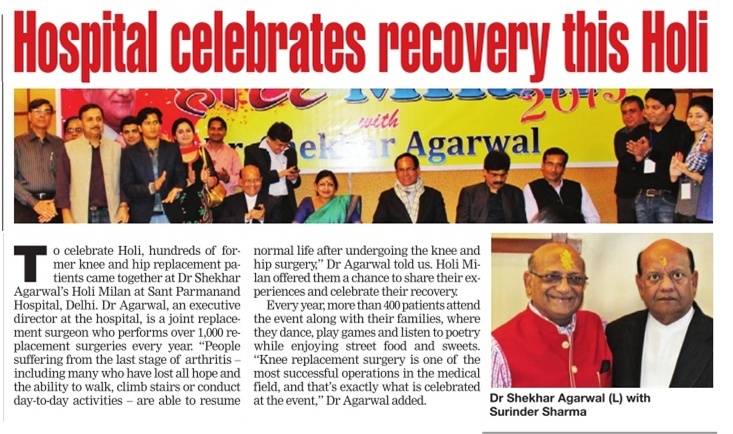 Knee replacement surgery is one of the most successful operations in the medical field, and that exactly what is celebrated at Dr. Shekhar Agarwal’s Holi Milan. For more information on knee replacement and hip replacement surgery, please visit our websitewww.drshekharagarwal.com. 56 years old lady , 11 years post bilateral Total Knee Replacement. Developed acute infection on the left knee. Debridement carried out but infection did not settle. Patient taken up for 2 stage revision surgery. 1. 1st stage revision done and k- nail along with antibiotic loaded cement spacer placed in the joint. 2. Wounds healed but patients presented with supracondylar fracture 9 weeks after the 1st stage revision. 3. She was taken up for revision surgery. Thorough debridement was done. 4. Bone defects on the femur and the tibial side were reconstructed with trabecular metal cones and Rotating hinge- Total knee replacement with long intramedullary stem on the femur.